Schedule and Commentators for College Football’s Best Opening Weekend on ESPN’s Networks - ESPN Press Room U.S.
College football’s best opening weekend will be highlighted on ESPN’s networks by seven marquee games over Labor Day Weekend and more than 40 games overall Thursday, Sept. 1-Monday, Sept. 5, across ABC, ESPN, ESPN2, ESPNU, ESPNEWS, SEC Network, ACC Network Extra and ESPN3. In addition to three nights of marquee games in prime time – No. 12 USC vs. No. 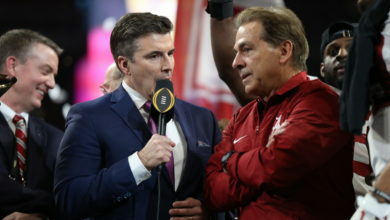 1 Alabama on ABC’s Saturday Night Football and on ESPN Radio (8 p.m.), No. 9 Notre Dame at Texas in a special ABC Sunday prime-time presentation (7:30 p.m.) and No. 4 Florida State vs. No. 14 Ole Miss on Labor Day night (8 p.m. on ESPN and ESPN Radio) – ESPN’s networks will televise 13 top 20 teams and, overall, 14 ranked teams in the season’s first full week. Among the must-see games on Saturday, Sept. 3, include No. 2 Clemson at Auburn (9 p.m. on ESPN), Hawaii at No. 3 Michigan (noon on ESPN), No. 5 Oklahoma vs. No. 18 Houston (noon on ABC), No. 6 LSU vs. Wisconsin (3:30 p.m. on ABC) and No. 13 Georgia vs. No. 19 North Carolina (5:30 p.m. on ESPN and ESPN Radio). In addition to highly ranked teams facing off and some of the sport’s biggest brands, the location of games adds to the interest, as Lambeau Field hosts its first college game in more than 30 years and 2016’s first college football Saturday begins in Dublin, Ireland. On Thursday, Sept. 1, No. 11 Tennessee will host Appalachian State (7:30 p.m.) and South Carolina plays at Vanderbilt (8 p.m.) to begin SEC Network and ESPN’s week 1 television slate, respectively. In addition to SEC Nation being on-location in Knoxville, Brent Musburger and Jesse Palmer will call the game with Laura Rutledge working double-duty, reporting both for the SEC Network’s traveling road show and the game telecast. Mark Jones, Rod Gilmore and Quint Kessenich will be in Nashville when the Gamecocks and Commodores matchup. On Friday, Sept. 2, in Denver, new commentating crew of Adam Amin, Mack Brown and Molly McGrath will make their Friday night debut when they call Colorado State vs. Colorado from Sports Authority Field at Mile High on at 8 p.m. ESPN. The season’s first full Saturday of games begins early from across the pond when Georgia Tech plays Boston College from Dublin, Ireland, at 7:30 a.m. on ESPN2. Jason Benetti, Kelly Stouffer, and Paul Carcaterra will be live from Aviva Stadium for the early morning kickoff in the United States. ESPN will televise three games, beginning at noon with No. 3 Michigan hosting Hawaii with Mike Patrick, Ed Cunningham and Dr. Jerry Punch on the call. In addition to the previously mentioned ABC triple header, ESPNU and SEC Network will also televise three games, while ESPN3 and ACC Network Extra will carry more than 10 games combined (schedule below). This season, college football will begin with week 0, when Hawaii plays Cal from ANZ Stadium in Sydney, Australia, on Friday, Aug. 26, at 10 p.m. on ESPN. Allen Bestwick, Mike Bellotti and Warren Smith will be on the call. The next night the third annual FCS Kickoff will take place in prime time when defending Big South champions and No. 6 Charleston Southern visits five-time defending champion and No. 1 North Dakota State at 7:30 p.m. on ESPN. Amin, Brown and McGrath will make their debut as a commentating team that night. In addition to Steve Levy and McGrath, new commentators for ESPN’s college football game television coverage include reporter Kris Budden and analysts Dusty Dvoracek and Clint Stoerner. 8 p.m. Colorado State vs. Colorado from Sports Authority Field at Mile High in Denver, Colo.
3:30 p.m. No. 6 LSU vs. Wisconsin from Lambeau Field in Green Bay, Wis.
8 p.m. 2016 Camping World Kickoff: No. 14 Ole Miss vs. No. 4 Florida State from Camping World Stadium in Orlando, Fla. Please note: ESPN.com’s “way too early top 25” rankings were used for this release. ESPN will utilize AP Rankings once they come out on August 21 for the start of the season. FCS Rankings were only utilized for the FCS Kickoff and are per the FCS Coaches’ Poll (Aug. 8).